The risk of blood clots in pregnant mothers is almost ten times more likely than a non-pregnant woman. Provide the recommended prophylaxis regimen, depending on whether the mother is antepartum or postpartum. Reassesses the patient every 24 hours or upon the occurrence of a significant event, like surgery. Ensures that the mother is provided appropriate VTE prevention education upon hospital discharge. 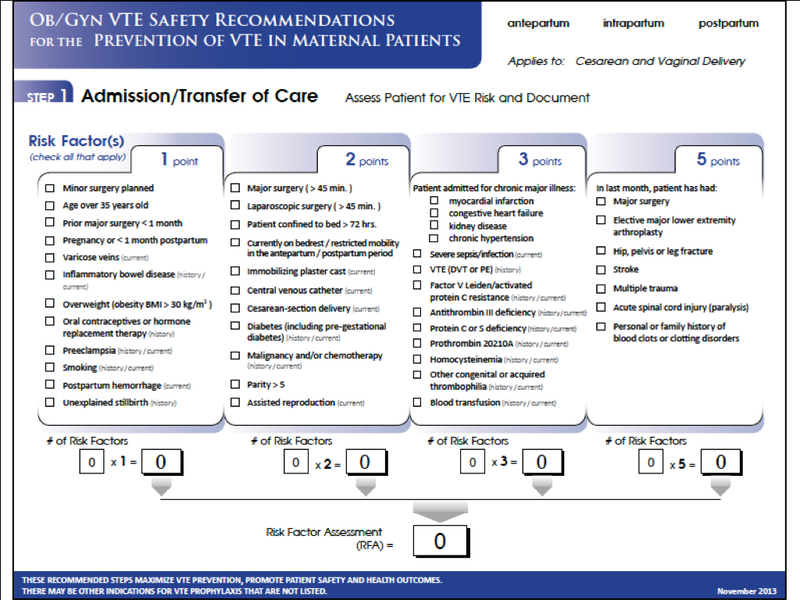 The OB VTE Safety Recommendations address a critical patient issue, according to Frank Federico, RPh (Executive Director at the Institute for Healthcare Improvement and Patient Safety Advisory Group at The Joint Commission). The health and well-being of mothers and infants is central to the efforts of the National Perinatal Association. MaryAnne Laffin, NP, CNM, FACNM (Past President at the National Perinatal Association) says that pregnant mothers need to understand the added risk of VTE that pregnancy and delivery by cesarean section brings. In addition, they need to be aware of this risk not only antepartum or prior to delivery, but that this risk continues upon discharge and up to one month post partum.